Szpor said he had chances to walk-on at some FCS schools in California, and also had scholarship offers from some NCAA Division II schools. None of those opportunities appealed to him. “Wyoming was my cheapest and most exciting offer,” he said. Szpor arrived at UW this summer and worked out with the team. During fall camp, UW coaches asked if Szpor had ever been a holder on field goals and extra points. Szpor did it for three years in high school. UW gave him a shot, he did well and he was the guy in the Cowboys’ opener last Saturday against Northern Illinois. UW punter Ethan Wood was the holder last season. Szpor said Wood “is a very talented holder of the ball,” but added UW wanted to take its No. 1 punter out of that role if possible to avoid injury. “Its amazing. I’m getting a lot of recognition from my friends back home,” Szpor said. Szpor and another walk-on true freshman quarterback — Isaac Leppke — serve as UW’s scout team quarterbacks. The scout team quarterback emulates the quarterback of the opposing team UW plays each week. UW doesn’t play Fresno State this season, but will next season and that game should be in Laramie. The next time the Cowboys play the Bulldogs in Fresno is 2018 (unless the Mountain West office alters its current scheduling structure). I asked Szpor if he grew up a Fresno State fan. 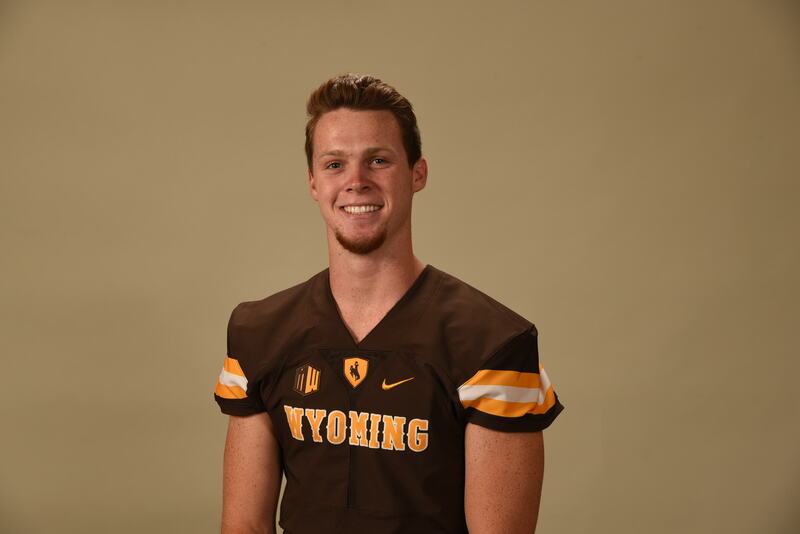 Got a cool story running in Wednesday’s Wyoming Tribune Eagle, the Laramie Boomerang and online at wyosports.net on UW sophomore free safety Andrew Wingard and his family ties to the Nebraska football program and the state. Be sure to check it out. For a preview, here’s the video interview I did with Wingard Monday. This entry was posted in Football, Uncategorized and tagged Brent Vigen, Ethan Wood, Fresno State Bulldogs, Gordie Haug, Isaac Leppke, Mountain West Conference, Nick Szpor, Wyoming Cowboys, Wyoming Football by Robert Gagliardi. Bookmark the permalink.